In today’s competitive collision repair market, reducing job delays, while providing a quality finish are keys to success. 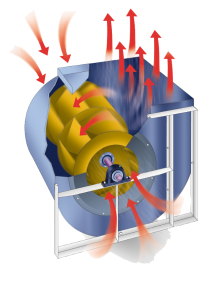 That is why Garmat USA uses a dual inlet, reverse incline fan with airfoil blades on all standard models, spray booths and CTOF’s. What does that mean for you as a shop owner? It means consistent air flow and cleaner paint jobs! Garmat HMA/AMU’s are purposely designed to be efficient while still providing a superior painting environment. The Garmat heated units feature an aluminum/stainless steel direct fired burner. The direct fired burner is the most efficient method of heating air for a paint booth as the airflow pattern is closely controlled using profile plates resulting in 100% efficient combustion. 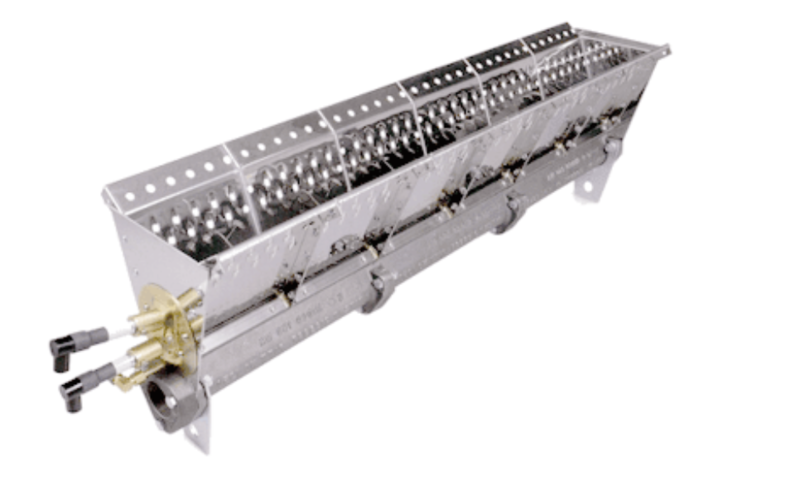 With a 25-1 turndown this burner provides a more consistent temperature control while optimizing energy usage. Installation is also simplified as the burner does not require vents and set up includes simply setting the gas pressure. Direct Fired Burners do not have heat exchangers nor do they require blowers, this further reduces energy consumption and also simplifies maintenance. The stainless steel/aluminum construction ensures a long and corrosion resistant life. 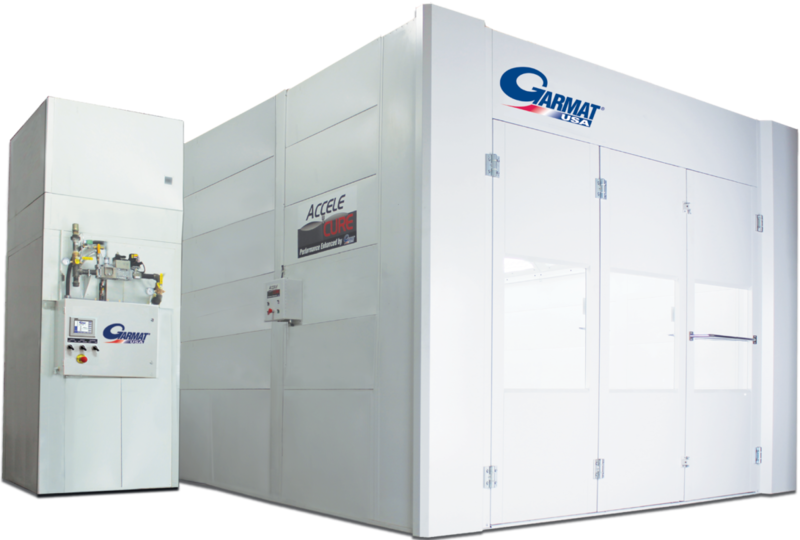 All Garmat mechanicals are engineered, built, and tested in-house at our very own ETL Listed Mechanical shop. Ensuring each meets the standards to ensure a safe and code compliant operation. 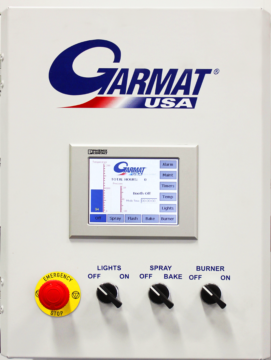 All Garmat USA products are provided with a listed industrial electrical control panel. All components are recognized, listed or certified by UL, ETL or CSA. Prewired control panel for reduced field installation time and costs. Our premier touch screen controls includes all the functions you need to run your operations efficiently. User friendly interface features switches and touch screen, with self-diagnostics built in. Optional WIFI upgrade allows you to operate and monitor your paint booth from a smartphone, tablet or PC. Data retrieval capabilities also available. 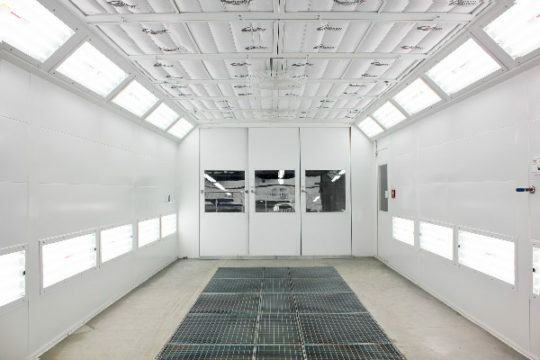 One of the most important things to consider when purchasing a spray booth is the optimal lighting. Don’t get fooled into believing that any old lighting set up will do. If you want a truly shadow free spraying experience, your painter should not have to fight shadows when standing in front of a light fixture. 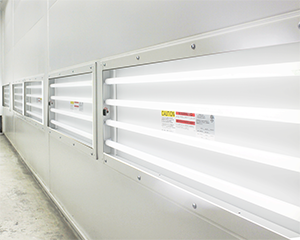 Garmat Spray Booths features horizontally placed lighting in the sidewalls to illuminate the work regardless of the painter’s position, virtually eliminating shadows. Horizontally oriented for optimal illumination. We’ve been inside enough body shops in the last thirty years to realize that when a filter is too difficult to change, it never gets changed. And we don’t have to tell you what a dirty filter does for a high production paint booth. We have designed our Ceiling filters and frames with the end user in mind. Simpler locking mechanisms, lighter frames, easier access. 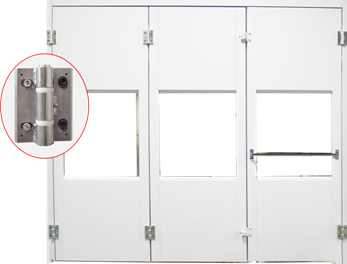 Steel knife edge closures provide a tight and secure fit. Who says the grates on your exhaust pits have to be too heavy to lift? Our pitted booths feature grates that are light weight yet heavy duty. We even have a specialized lifting tool to lift our grates out for easy access to the filters. – Internal latching mechanisms, providing a sleek finish and eliminates dirt collection zones found in competing brands of booths..
From changing lights to changing filters and everything in between we have made it simple.